Ecuador Volcanoes Jan 2011 - Pre Trip Prep! Over the course of the last few months members of our upcoming Ecuador Volcanoes expedition have been training to be in shape and have good skills coming into the trip. Some have been ticking off steep water ice climbs in Ouray and others working on using crampons for the first time! In early December Brad, Eric and Jeff managed to get out for some early ice climbing in NH in Crawford Notch and got Jeff immediately into WI 2 climbing on Lost in the Forrest. Eric had already gotten in a few other days soloing up moderate (but 2500ft long!) 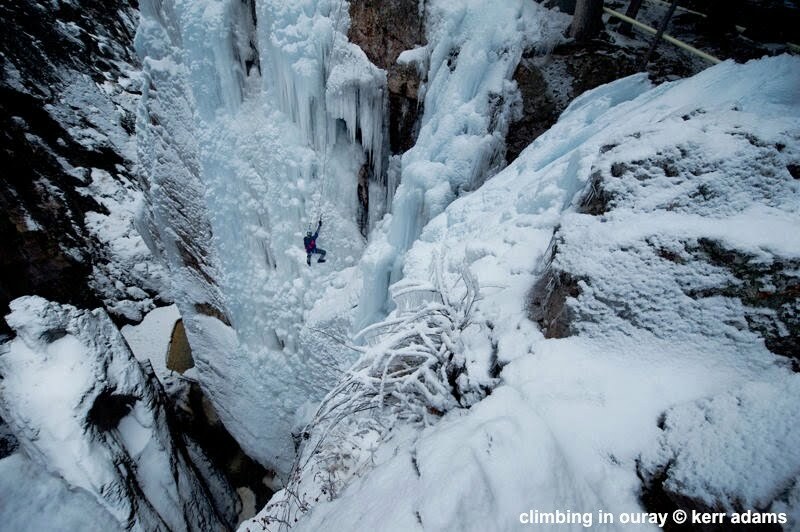 climbs like Shoestring gully. 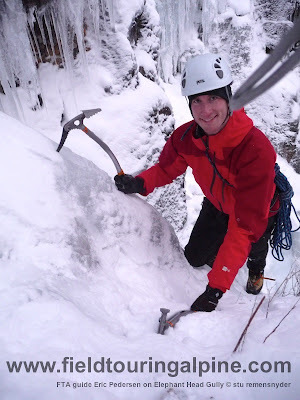 On the 16th of December Brad, Eric, Kellie and I joined forces for a play day on Willey's Slide and enjoyed many hours of low angle crampon and ice axe practice along with going over roped team climbing. 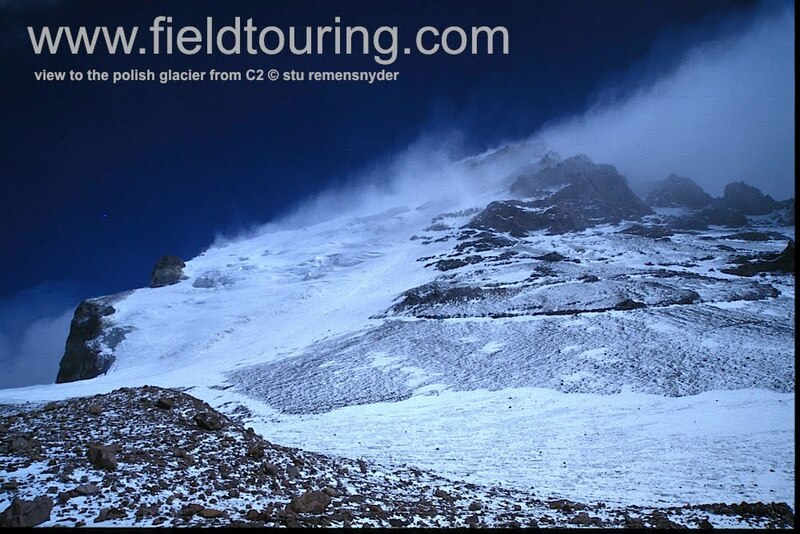 We finished our morning with an ascent to about the half way point using running belays on terrain steeper that our members will see on most of Cotopaxi. 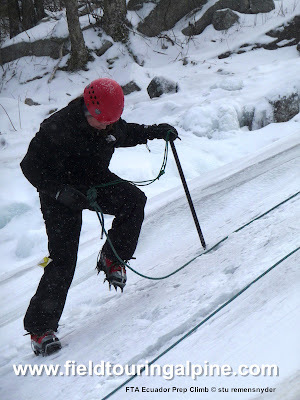 At the end of the day Eric and I simply could not pass up a chance to use the fine points of our crampons and ice tools and ambled over to the base of Elephant Head Gully. The intention to simply "have a look"soon turned into a wonderful 2 pitch climb on mixed WI3 terrain that finished in the moonlight with big grins on our faces. We savored a fine ale at Faybyan's Station and rehashed the sketchy climb and made plans for more fun outings ahead! Some of our team will already be in transit this weekend and we are excited to see the first pics and reports from Quito in just a few days. We hope you enjoy following along! 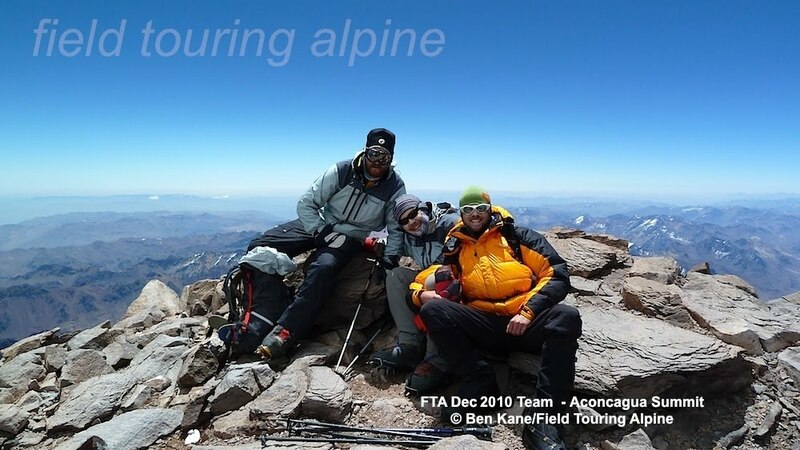 Aconcagua Dec 2010 Falso - Summit Report! Dean, Saul and myself arrived back in Mendoza last night and celebrated our summit success in fine style with a great dinner at Facundo's restaurant and then on to the Irish pub for a few drinks. The past three weeks have been incredible, a really fun time with two great guys. The expedition started out with a bit of drama, with both Saul and Dean struck don by a nasty gastro infection, but both soldiered on and pulled through to be very strong on the mountain. 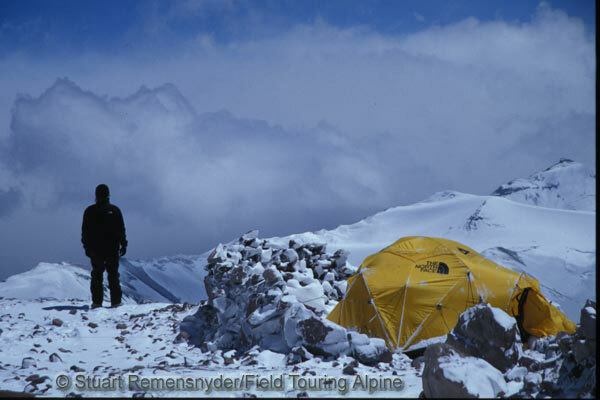 We encountered some very cold weather in the early part of the trip, especially the load carry days to Camp 1. I decided against moving to Camp 2 due to high winds, and we instead traversed to the more sheltered Camp Guanacos (Camp 3). 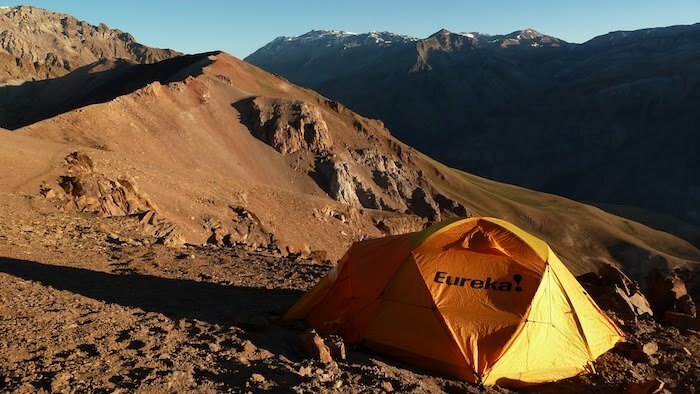 We moved up to Camp Colera on the 24th, deciding against a rest day at Guanacos due to a weather report indicating the 25th to be a potential summit day. This was to be a vital decision as the weather indeed turned out to be too good to be true. The morning of the 25th was as still as I've ever seen, not a breath of wind and incredibly warm. We started out in our down jackets and mitts, but 10 minutes later we were stripping down to fleece and shells. A large French group, an Alaskan Mountain Guide's group and some independent climbers made up the push, with about 30 or so people pushing for the top. We summited at 2:40pm, about 8 hours from Colera. We spent half an hour on the top, really enjoying the summit and just taking it all in. The descent was fine, and we made it back to Colera with plenty of daylight left to melt snow and rehydrate. I have to comment on Dean and Saul - both were very strong, and we made a good team. 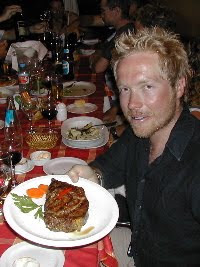 I also have to thank Lanko, our Argentinian outfitters. Jose and Osvaldo are amazingly helpful. The staff at both Base Camps, Plaza Argentina and Plaza de Mulas were exceptional. Thank you to Carlos and Vanessa (Plaza de Mulas) for the great pizza feast post summit and a big thank you to Paula (Plaza Argentina) for the great food that made it possible for us to get up the hill. Thanks for following along with us. Take care and hope to see you out in the mountains soon! FTA Aconcagua Dec Falso - Summits! We have just had word in from Ben at Plaza de Mulas that the team has returned successfully from the summit and a complete traverse of the mountain! We'll look forward to more news soon!! We summited yesterday, Christmas Day at 2:40pm. The weather was extrodinary, so warm and not a breath of air. We hike out to Horcones tomorrow, have a quick shower at Penitentes and then straight to Mendoza for a great meal at Facundos, which we've all been anticipating. I'll send a more detailed disatch tommorrow including pictures. Totally amazing climb and everyone is stoked to have reached the top. Ben from Plaza de Mulas! Baby Beef at Facundo's is not to be missed! FTA Aconcagua Dec 11 Falso - In BC and heading to C1! 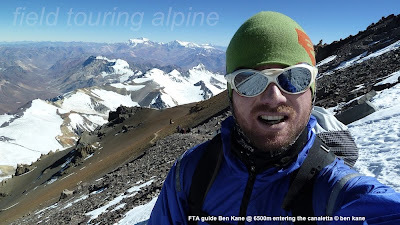 Ben has dropped a nice note in from Plaza Argentina base camp ( approx 4200m/13800 ft) to let us know that all is well and that they have been enjoying themselves on the trek and at base camp. 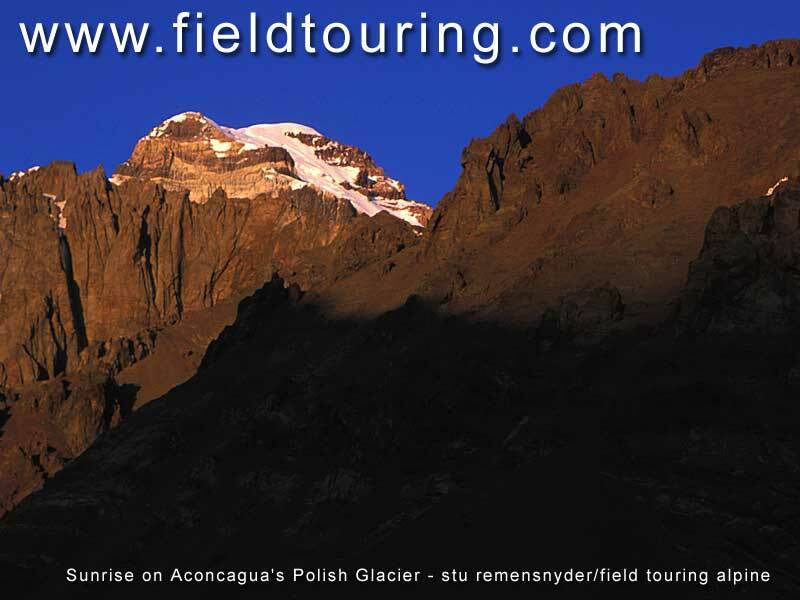 The have had a great view to the Polish Glacier from the base camp and soon enough will be walking right past its base. They arrived to find a great deal of damage done to base camp by a serious wind storm a week ago. 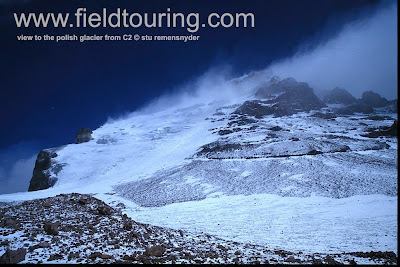 Ben said that nearly every outfitter sustained damage from 100 kph winds and that the winds remain strong still on the mountain. For this reason Ben and his crew plan to take the lower traverse to Colera Camp and avoid the traditional but exposed C2. 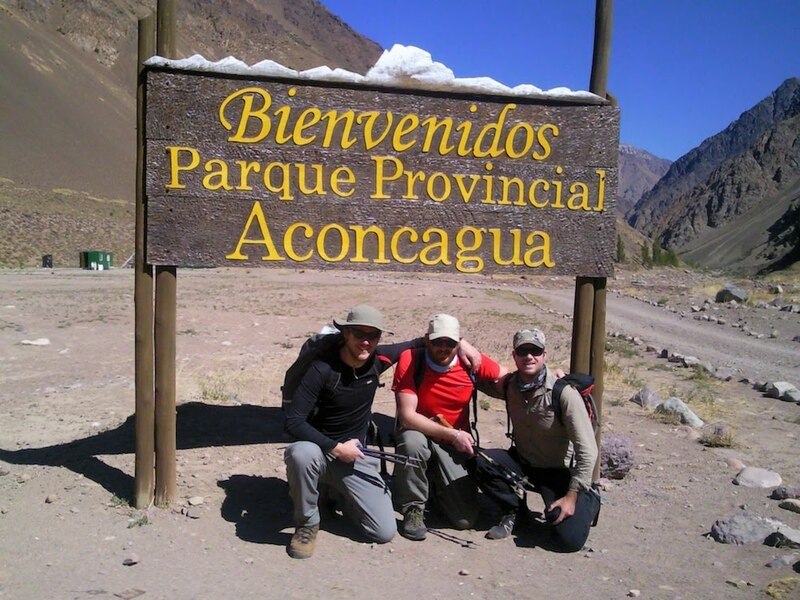 Dean and Saul were hit by a GI illness they picked up in Mendoza but it seems not to have slowed them down and they have showed great strength on the trek in and on the carry to C1 so this is good news! They are now working their way up the hill and are in C1 at this time and will be heading towards the higher camps in the next few days. If Ben gets a chance to drop back to BC before the summit bid we'll post any updates but the next news may well not be for 4-5 days more. They are still on target for a summit bid on the 25th or 26th if the weather cooperates! The winds speeds have been in excess of 100kph on and off at the highest levels in the last week and look to be subsiding at the week goes on and summit winds are predicted to be in the 20-30kph level by the 25th and even lower for the 26th and 27th so this is great news! 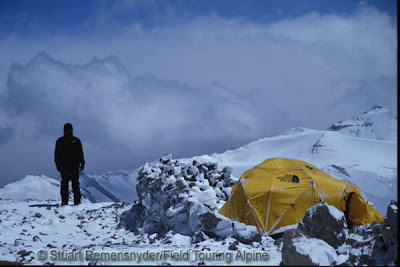 In 2003 I took the image below during one of the 3 days we spent pinned down by high winds which can be strong enough on Aconcagua to shred tents and toss people. When the winds subside one can enjoy the views and the climb and we'll hope our team sees these gentle days for the summit bid! 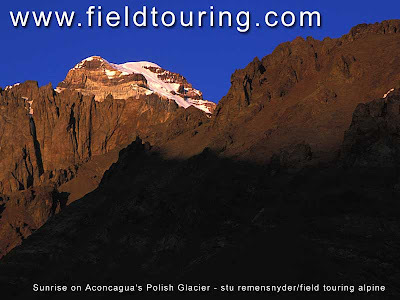 FTA Aconcagua Dec 11 Falso - heading to BC! 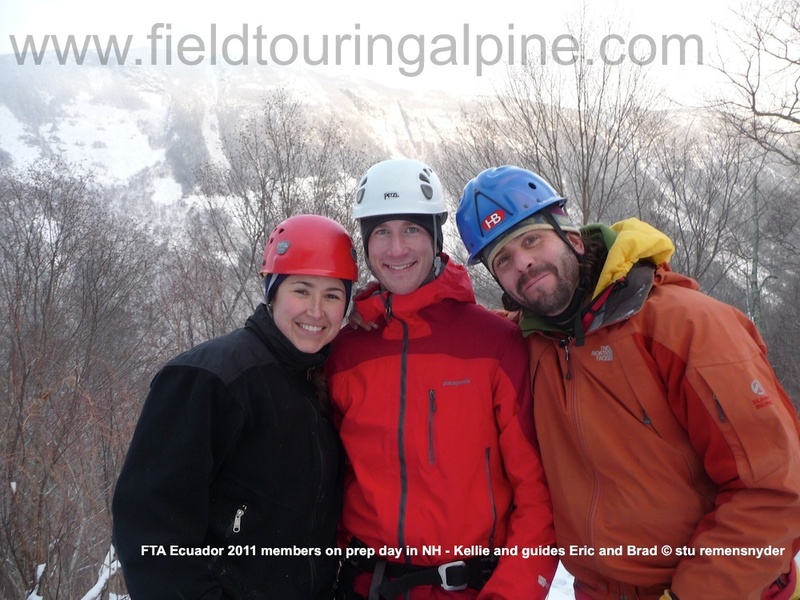 Our December Falso trip under the leadership of Ben Kane is off and running! 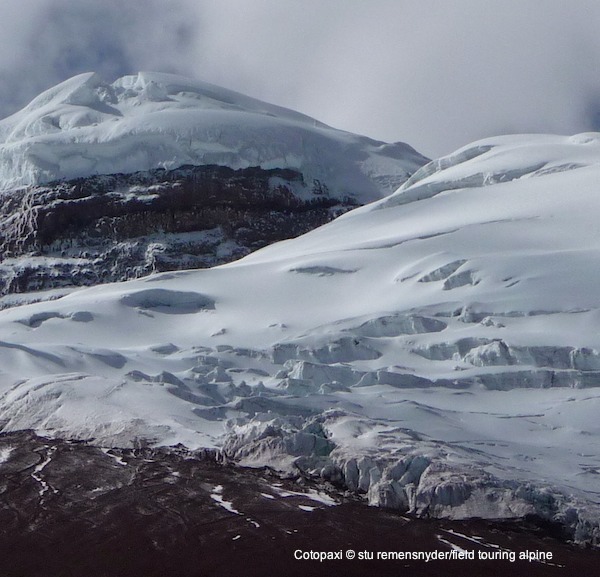 They will be pulling into the base camp shortly and preparing to begin the climbing phase of the trip. We look forward to hearing their news shortly and until then enjoy a note from Ben about the trip ahead! Tomorrow Saul Willers and Dean Slawson and myself will be departing Mendoza, bound for Penitentes. winding through canyons before coming out onto the plain at Uspallata. We'll have a lunch stop here before continuing onto Penitentes, gaining height to an altitude of 2500m. surrounding Penitentes, just below the summit of Cruz de Cana peak. Below is a photo of our camp during a magnificent sunrise. An amazing vista to wake up to indeed! gear, tents, stoves, food etc and prepare our loads for the mules to carry. We'll be hiking for three days and arrive at Plaza Argentina on the 16th, our base camp for our attempt on the False Polish traverse. Weather and acclimatization allowing, we'll be heading for a summit bid on around the 25th, so fingers crossed we'll be celebrating Christmas on the top of South America! Stay tuned for more dispatches and pictures from the mountain! 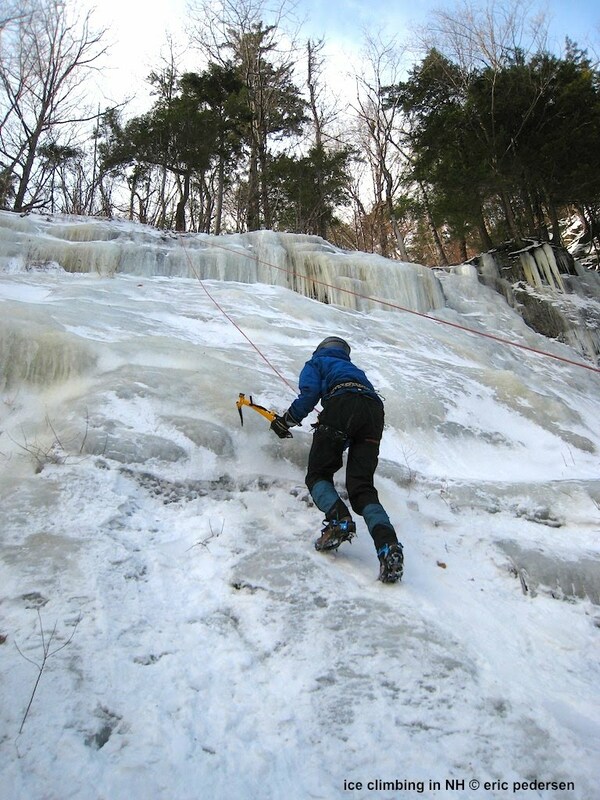 The American Alpine Journal (AAJ) has a new section on their site which will help visitors to enjoy some of the very best articles, trips reports & club proceedings. They have a vast store of articles and for most people it is ard to know where to start! "The idea here will be to feature the most fun, best written, exceptionally exciting, historically interesting, inspiring, or just plain useful articles and reports that have been published in the roughly 25,000 pages of AAJs since 1929." One of the first and most impressive articles is by Charles Houston and a worthy read for anyone heading to the mountains about agonizing decisions and their consequences in the mountains. You can all help the AAJ with suggestions for good articles from past journals as you peruse their offerings.